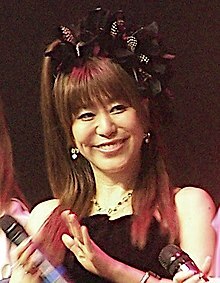 Chihiro Yonekura (米倉 千尋, Yonekura Chihiro, born August 19, 1972) is a Japanese singer and songwriter from Yokohama, Kanagawa, Japan. While Yonekura was attending university, she sent off several demonstration tapes to recording companies. She was scouted out, and received the opportunity to do the opening song "Arashi no Naka de Kagayaite" for the anime Mobile Suit Gundam: The 08th MS Team, as well as the ending song, "10 Years After". She debuted with a single containing both, which was successful. That same year she released three other singles and an album. Yonekura quickly gained a large fan base, and many shows selected her songs for opening and ending themes. She has now been singing and touring for 10 years. To celebrate her success, she released an album in 2005 entitled Cheers.